Our product range includes a wide range of spill containment pallet, horizontal drum pallet, vertical drum pallet and ms drum pallet. We are pioneers in mild steel spill pallets and sumps. Our steel models provide compliant spill containment. These Oil Sump pallet/ Spill containment pallet are tough, chemical resistant and lightweight and has a removable metal mesh floor for easy cleaning. These pallets provide forklift access for easy relocation. Supported by experienced professionals, we are offering a beautiful range of Horizontal Drum Pallet that are used in different industries. The offered pallets are manufactured by utilizing innovative technology and superior quality raw material. 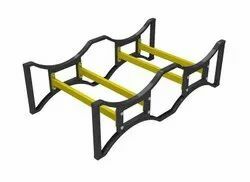 As per the demands of clients, we offer these pallets in different dimensions and specifications. 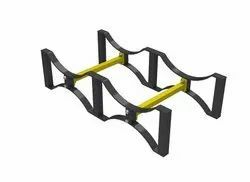 Moreover, provided pallets are widely praised for their quality features like high strength. We have emerged as a trustworthy manufacturer and supplier of optimum quality Vertical Drum Pallet that are used in packaging industry. The offered pallets are precisely designed using the best quality raw material and sophisticated technology so as to meet the industry quality norms under the guidance of adroit professionals. Moreover, our users’ can avail these pallets in diversified designs and colors at affordable price. 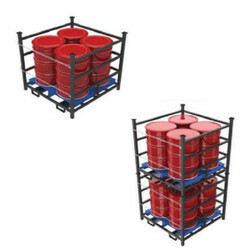 Designed to store four drums per pallet in Vertical condition. Stackable up to Ground + 3 high. Provides the quickest, safest & easiest method of moving and handling loaded steel drums. Can be moved individually or by the stack with a forklift truck. Accessibility from all four sides. Construction of Drum Pallets are from MS pressed channels / rolled sections / Formed sections. We are instrumental in offering a wide assortment of MS Drum Pallet that are used in furniture industry. The offered pallets are designed with the aid of supreme quality raw material and ultra-modern technology under the vigilance of our proficient professionals. Before delivering to our clients', these pallets are thoroughly checked on different parameters by our quality examiners assuring their quality and durability.